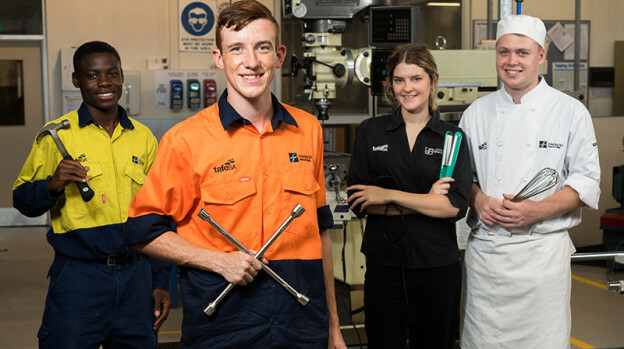 Adelaide high school, St Patrick’s Technical College, is a shining example of empowering young people thanks to its education model that sees an unemployment rate of past students of just one per cent. Responding to two national reports released today (the Mitchell Institute Preparing Young People for the Future of Work report and the Brotherhood of St Laurence Generation Stalled report), St Patrick’s Technical College business development manager Patrick Kelly said the college was proof that investing in students’ employability – and not university entrance numbers – could lead more work-ready and successful youth. StPatsTech is bucking the trends mentioned in both reports – high youth unemployment and students not coming out with the skills to enter the modern workforce. The college recently released an interim report that tracks past students and it shows the past student unemployment rate is just one per cent. Three out of five students from the college will commence an apprenticeship with 93 per cent going onto complete their training. Of the respondents, 16 per cent were self-employed and many reported they stayed in the northern Adelaide area. Mr Kelly said while a full report would come out later this year, the college firmly believed its success was down to a holistic approach to education. Mr Kelly said the college was already doing many of the recommendations to come out of the Mitchell Institute report, such as building students’ capabilities, valuing vocational education, and supporting students with career advice and mentoring. “I welcome the Mitchell Institute report and encourage the authors to take a closer look at what we are doing here at St Patrick’s Technical College. We are the realisation of their ideal outcomes to improve employment outcomes for our youth,’’ Mr Kelly said. Mr Kelly said he welcomed the report’s comment that high quality VET systems are essential to ensure the country has the skilled workforce needed for the 21st century. “The report says ‘A university education is not a good fit for all young people, and not necessary for all jobs’, that is something we at StPatsTech have been saying for the past decade,’’ Mr Kelly said. The Brotherhood of St Laurence report showed that as of February 2017, 282,000 young people were unemployed and 377,000 were underemployed. This, the report says, means the youth unemployment rate it at its highest in almost 40 years. Students achieve their SACE while concurrently studying a TAFE SA Certificate II in their chosen trade. Work Ready Skills program that focusses on developing students’ self-management, communication, planning and organisation, problem-solving, teamwork. One of the most comprehensive School-based Apprentice Programs. SbAT students can spend as little as six weeks at school while undertaking their first year of an apprenticeship. These students finish year 12 with their SACE and a job. More than 400 local employers – from small businesses to multi-nationals – have partnerships with the college. P-TECH school – in November 2016 St Patrick’s Technical College was announced as the only SA school to be included in this Australian Government pilot program. P-TECH aims to ensure future generations of young Australians have the skills to equip them for the 21st century workforce through partnerships with education, industry and community. There is a strong focus on STEM (science, technology, engineering and maths) subjects and development innovative, engaged thinkers. Extensive work experience program – students are encouraged to undertake at least six weeks’ of work experience per year. This has led to many of our students securing apprenticeships and employment following graduation. St Patrick’s Technical College is a $15 million purpose-built facility in Edinburgh North and runs courses in three schools: the School of Building and Construction; the School of Community Services, Hospitality and Lifestyle; and the School of Engineering and Transport. Copies of the interim report are available on request. This entry was posted in Latest News on 27/03/2017 by St Patrick's Technical College. Energy. How much there is generated and where it comes from are a hot button topics for every South Australian at the moment. 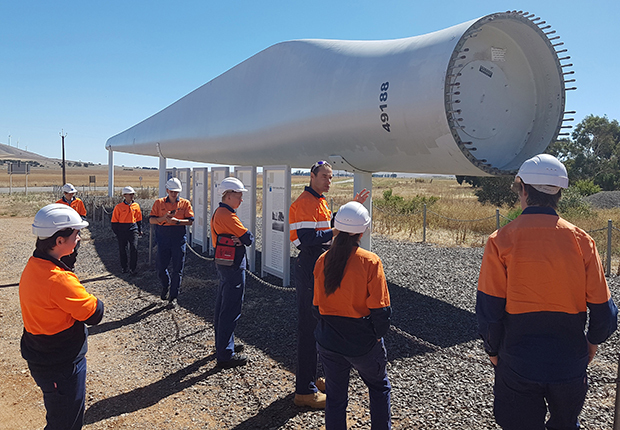 Students from St Patrick’s Technical College were lucky enough to answer some of those questions on a field trip to AGL’s Hallett Hill Wind Farm recently to see energy in action. 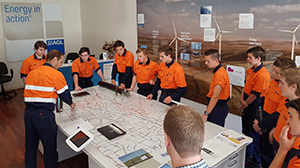 More than 30 Electrotechnology students from Y11 and Y12 made the two hour bus trip north to Burra to take a closer look at wind energy thanks to AGL. Hosted by AGL’s Asset Performance Analyst – Wind and Solar, Stuart Whiting and Vestas Australian Wind Technology’s, Hugh Cameron, site supervisor Hallett Hill, the students were given a tour of the internal base of a Suzlon Model S88 wind turbine. Awed by the size of the turbines, Y12 student Conor Griffiths said he’d never been that close to a wind turbine before. “The overall size was overwhelming,’’ Connor said. The students also made a visit to the information centre at Burra where Mr Whiting discussed where and why wind farms were located and how the farms were designed and planned. Students were also given an overview of the types of roles and skills needed to run a wind farm and the part the farms play in power production for the state. Teacher Mr Michael Haddad said the students have been studying renewable energies as part of their classroom work and the field trip gave them insight into the industry, the technology and also employment options for their future. Following the visit, St Patrick’s Technical College released an interim report that tracks past students pathways to employment. The report showed that 93 per cent of graduates will go on to complete an apprenticeship. Business Development Manager for St Patrick’s Technical College, Mr Patrick Kelly, said industry site visits like the AGL tour were important to help give students in-class learning context. It also clearly shows students career outcomes they could achieve through apprenticeships and learning a skilled trade. The interim report also showed that 99 per cent of respondents were employed following their graduation for St Patrick’s Technical College, which is located in Adelaide’s northern suburbs. This entry was posted in Industry Office, Latest News on 23/03/2017 by St Patrick's Technical College. To prepare for the world beyond school, students at St Patrick’s Technical College will commence P-TECH courses focused on Electrotechnology and Engineering (Production Technology) this year. Students will take part in a range of industry supported learning experiences and Cross Disciplinary Studies that will extend their education beyond traditional classroom exercises. The P-TECH program includes opportunities to connect and build relationships with industry partners, and engage in hands-on, project-based activities, both at school and in the workplace. These experiences will help students to better understand the relevance of their learning and how it can be applied in the workplace. Last week, on International Women’s Day (IWD), female students of St Patrick’s Technical College hosted a luncheon with the theme for IWD 2017 “Be Bold for Change”. The event had a strong focus on Women in STEM. Guest speakers included Dr Rebecca Heyer and Mrs Linda Burton. Dr Rebecca Heyar joined the Defence Science and Technology Group (formerly DSTO) in 1999 and is currently a Discipline Leader in the Intelligence Analytics Branch. Throughout her talk, Rebecca encouraged students to make the most of new opportunities. “Move around: get out of your comfort zone, even if it’s only for a little while. The lessons you learn can be applied wherever you head next” she said. 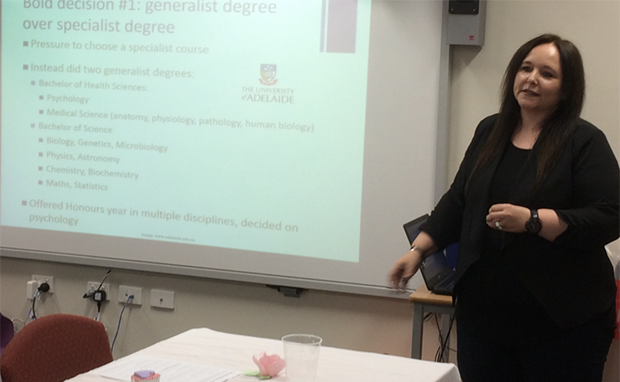 Rebecca holds degrees in Health Sciences and Science (with Honours) and postgraduate qualifications in Criminology, Mathematics & Statistics, Scientific Leadership, and Psychology. She offered sound advice to students who are unsure of their desired career path. “Don’t be pressured into taking a particular path and don’t limit your choices if you don’t know what you want to do. Generalist studies can enable you to find your niche while trying a wide range of new and interesting things” she said. During her time with DST Group, Rebecca has worked in the fields of multinational experimentation and wargaming, social network analysis, whole-of-government crisis management, and human identification technology for Defence, intelligence, and national security clients. Linda Burton, Maths and Electrotechnology Teacher at St Patrick’s Technical College gave a very open, honest and heart wrenching presentation about the challenges during her life, particularly around domestic violence and how she overcame adversity. Linda left school early without completing year 12 and then returned school to complete her SACE as an adult. She had a passion for science and wanted to go to university. Linda established a career as a Viticulture Biologist after completing a Science degree (whilst raising her son who is now 25 years old). She went on to later fulfill her long life dream of completing an electrical apprenticeship (as a mature age apprentice), winning awards at both a state and national level. Following this, she had a second child (now 6 years old) and has continued her passion for teaching and tutoring young people. Linda previously completed her TAE and worked as a trainer in an RTO in particular to Electro-technology school students undertaking a VET programs all whilst studying her teaching degree. Linda also owns a successful electrical contracting business with her husband in Northern Adelaide who employ and train their own apprentices. Teaching at St Pat’s provides Linda with the work/life balance to raise her young daughter and work within the family business. Both Rebecca and Linda stressed that their learning and education has never stopped and has contributed to their success. “Commit to lifelong learning to broaden your horizons and find an employer that will support you in this” offered Rebecca. The P-TECH pilot is supported by the Australian Government, which has engaged the Skilling Australia Foundation to manage the program. The P-TECH pilot at St Patrick’s is supported by the local community and the Catholic Diocese South Australia. This entry was posted in Latest News on 15/03/2017 by St Patrick's Technical College.